OCTOBER 2018 • FOODSERVICE EQUIPMENT & SUPPLIES • 41 pesticides involved? How was the farmer treated? What was the life cycle of delivery? Is it local, and what does local mean to your organization? What is its carbon footprint by the time it gets to the customer? These are all things that increasingly drive what we do. As a corporation, or as a provider of workplace hospitality, if you embrace even one of these dimensions and do so better than anyone else, you've cre- ated a unique niche for yourself that will resonate with employees for whom such issues are very important." For Unidine's corporate clients, current initiatives on the sustainability front include going strawless and/or transitioning to reusable stainless-steel straws as well as rethinking serviceware. 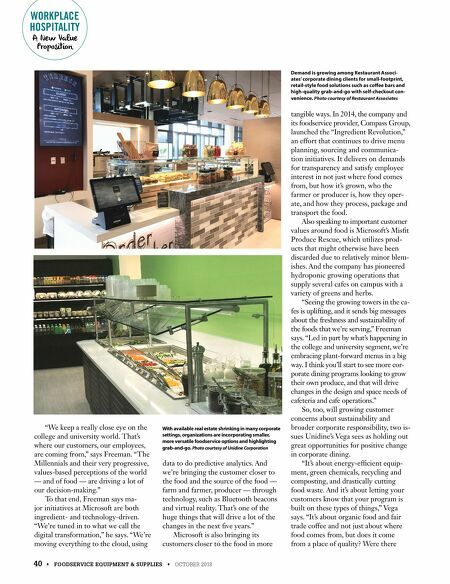 "Clients seem to be headed in one of two directions — either going to a fully compostable or biodegradable dispos- ables program or moving toward reusable service vehicles, such as melamine," Vega says. "Not china, but a durable, environ- mentally friendly alternative." At Microsoft, longtime a leader on the sustainability front, innovation around sustainability remains mission critical. The company's newest remod- el, for instance, transformed its existing Café 25 into a zero-waste facility. Unveiled in January, the new Café 25 is completely paperless. That translates to no straws, no paper receipts (they're emailed), no disposables for dine-in or takeout, and no paper menus or signage (it's all digital or projection). Canned beverages, available free to employees in coolers located throughout campus, were eliminated from Café 25 and replaced with infused waters made in-house and a fountain machine with reusable cups. To reduce food waste, a tossed-to- order salad station replaces Café 25's previous self-serve salad bar. Noble Fork, a new Slow Food-inspired, sustain- able diner concept, was incorporated and a partnership was forged with local specialty coffee company Onda Origins, which uses blockchain technology to trace coffee from origin to cup and virtual reality (VR) to share the experience. 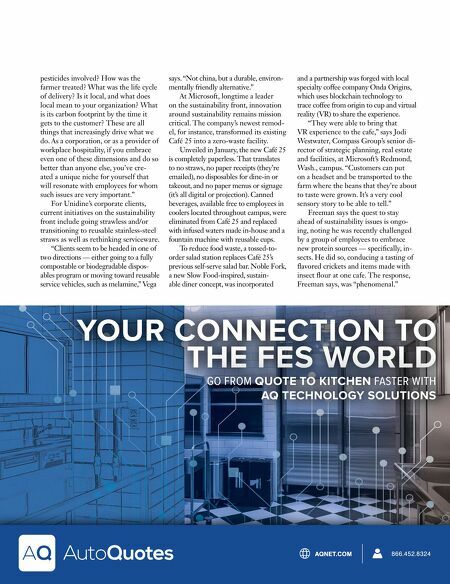 "They were able to bring that VR experience to the cafe," says Jodi Westwater, Compass Group's senior di- rector of strategic planning, real estate and facilities, at Microsoft's Redmond, Wash., campus. "Customers can put on a headset and be transported to the farm where the beans that they're about to taste were grown. It's a very cool sensory story to be able to tell." Freeman says the quest to stay ahead of sustainability issues is ongo- ing, noting he was recently challenged by a group of employees to embrace new protein sources — specifically, in- sects. He did so, conducing a tasting of flavored crickets and items made with insect flour at one cafe. The response, Freeman says, was "phenomenal."